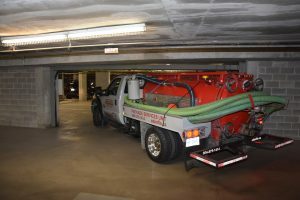 EdenFlo Pump Truck Service is the expert for drain cleaning in low clearance areas such as underground parkades. They have invested in the largest fleet of “Low Boy” vacuum trucks on the lower mainland. These specially designed trucks can access the lowest clearance areas in a parkade, putting the equipment right at the drain for cleaning. Because our equipment is so specialized, we are able to be the most efficient in cleaning the drainage and catch basins of your underground parkade. 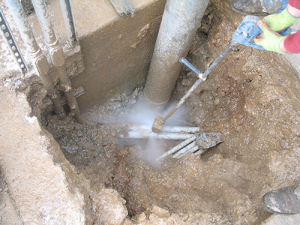 More efficient means less time on site – the job is done faster, better and at a fair price! Whether it’s catch basins, lift stations, sanitary or storm, Edenflo Pump Truck Service has the right equipment for the job. Phone: 604 575 1414 or contact us to be in touch with you. Talk to us about locking in 2017 pricing for scheduled maintenance on all contracts booked before February 28, 2018. This entry was posted in Parking Garage Drain Cleaning and tagged expert low clearance drain cleaning, lift station cleaning lower mainland, low ceiling drain cleaning, low clearance drain cleaning Aldergrove, Low clearance drain cleaning Burnaby, Low clearance drain cleaning Delta, low clearance drain cleaning Langley, low clearance drain cleaning New Westminster, low clearance drain cleaning Surrey, low clearance drain cleaning vancouver, Low clearance drain cleaning White rock, save money parkade drain cleaning, Storm drain cleaning, storm drain cleaning lower mainland, vacuum pump service for parkade on January 29, 2018 by Edenflo.